In Russia will soon resume production of the world's largest commercial cargo aircraft An-124-100 "Ruslan". This was at a meeting in Ulyanovsk Aircraft Factory Aviastar-SP ", RIA Novosti. The exact dates of resumption of production "Ruslanov" has not yet been identified. At the meeting it was decided as soon as possible to prepare the necessary documentation and send it to the government to finance the project could be included in the budget of Russia in 2010. It is anticipated that the re-release of AN-124-100 will help create a "Aviastar-JV over 2,3 thousand new jobs. In addition, through this project in the budgets of all levels will be able to get additional four billion rubles. The world's largest cargo plane was developed in the USSR in the late 1970's and was manufactured in Ulyanovsk and Kiev. "Ruslan" has fulfilled its first flight in 1982. Total of 56 such aircraft. It should be noted that in April last year, the then Prime Minister of Russia Viktor Zubkov said that Russia and Ukraine will begin to re-release "Ruslanov" in the third quarter of 2008. 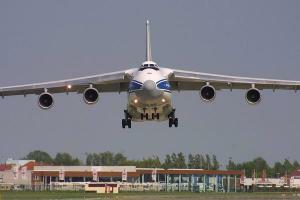 In addition, on plans to resume production of Antonov-124-100 described in the 2005 and 2006. So glad to here it. I love this plane. AN-124 is a good plane if you modernize it. That is a good buy and can put Ukrainians to work. They need it bad. Turk1 wrote: AN-124 is a good plane if you modernize it. That is a good buy and can put Ukrainians to work. They need it bad. Many Russians will be put to work as well. We own Motor Sich which makes the engines and provide the avionics frmo other companies. State KLA offers to resume production Ruslans in Ulyanovsk Aviastar, told two sources close to the corporation. This issue will be raised at the State Council Presidium meeting in Ulyanovsk. The meeting will be held November 24 and will focus on innovations in transportation, explained an official of the presidential administration. To start "Ruslan" require $ 500 million (refine aircraft, restoring production of components and so on.) Interlocutors told Vedomosti. The Corporation believes that it should be public money, something like a grant. In addition, we need first customer, they said, they could be the Ministry of Defense. Price of one liners will be about $ 200 million, the demand for these aircraft is estimated to KLA, about 70 pieces. AN-124 - the largest payload capacity (120 tons) in the world serial transport aircraft design Kiev Antonov. Until 2004, there were 56 cars, now Aviastar is one unfinished ship. Major operators - Air Force Russia (24 cars), "Volga-Dnepr Airlines (10)," Antonov Airlines "(7). The upgrade, known as the An-124-150, includes a glass cockpit capable of reducing the flight crew from six to four, along with airframe improvements, digital brake control, improved thrust reversers and major improvements in the aircraft's engines. The 124-150 will have a maximum lift capacity of 150 metric tons, compared to 120 tons for the basic aircraft. It will permit 10,000 flights and 45,000 flight hours with a first A-check required only after 500 hours on the wing. JAB would like to have at least one unique product and they may become "Ruslan", told by sources close to the company. Restore the production of AN-124, if the state finds the money, it makes sense, I agree, and expert at the Center for Analysis of Strategies and Technologies, Konstantin Makiyenko. But officials are reluctant to accept. It is unlikely that the Defense Ministry, which did not have enough money to repair the aircraft, has agreed to buy the new "Ruslan", said an agency official. Representative of the KLA refused to comment. State aid to the KLA and the need for debt restructuring. Total debt business corporation - about 160 billion rubles., And an acceptable level of load - about 100 billion rubles. Tell interlocutors "Vedomosti". Ideally, the KLA, according to their data, would pay 70 billion rubles. debt through the budget or the OFZ. But the Treasury insisted on restructuring of debts of about five years, offering subsidies to rates or state guarantees. Present government mechanism to repay the debt until December 15, told other people. Treasury officials had no comment. But the substance of the negotiations confirmed to Vedomosti "employee of the State Bank. The new An-124 will be built in Russia, as will the new Il-476s being built too. GarryB wrote: The new An-124 will be built in Russia, as will the new Il-476s being built too. Yes, the Ukrainian workers could probably do with the work but the Russian workers at Ulyanovsk need work too. My question is though, that most of the An-124s and Il-76s used by the west are leased and use Russian or ex-Soviet crews. Will the updating of the aircraft with two man cockpits make a western purchase of these aircraft possible? Obviously politically it is very unlikely, but the only western alternative being the enormously expensive C-17 that actually costs more than 4 Il-76s or 2 An-124s you would think common sense and cost cutting would make lots of countries sit up and think perhaps now while they are going back into production that a foreign order might be a great way to own very useful very capable aircraft. The original An-124 was already a very sophisticated aircraft with fly by wire (FBW) control systems. It is going to be a long time before we see new An-124s. If it is as advertised, there will be a market even in the West since they have nothing comperable. Hopefully the west can get over itself and take advantage of a good situation. The Germans and French want a new heavy lift helo in the Mi-26 class too so it will be interesting to see what happens. FARNBOROUGH, July 19 (RIA Novosti) - The Russian Defense Ministry may purchase some 20 An-124 Ruslan (Condor) heavy-lift transport aircraft according to the 2011-2020 state arms procurement program, a senior official said on Monday. "We are now working on this issue... We intend to buy about 20 such aircraft," said Deputy Defense Minister Vladimir Popovkin, who is in charge of arms procurement. He said an agreement on the modernization of the Ruslan planes which are currently in service had been signed earlier this year. "We plan to modernize two planes annually, and starting from 2015-2016, if the manufacturers are ready, we will start purchasing them," he added. In June, Boeing said it may conduct the final assembly of Russian-Ukrainian An-124 Ruslan heavy-lift transport planes for the U.S. market - a move which drew much criticism from the Ukraine-based Antonov Design Bureau. The An-124, which can be used both for domestic and military purposes, was designed by the Antonov Design Bureau in 1982, and was produced in Ukraine's Kiev and Russia's Ulyanovsk until 1995. The plane has a maximum payload of 150 metric tons with a flight range of around 3,000 kilometers (1,864 miles). Can some one tell me what was the purpose of building a huge transport aircraft like An-124 for Soviets , I understand it carries heavy load and has long range but were these built as part of specific warfare doctrine ? When things have to be delivered quickly but they are large without such aircraft you need to take the things to bits and transport the bits and then put all the bits back together. With lots of different things transported in different lots things can get lost or damaged and everything takes longer. Moving large objects by air is much simpler and cheaper than trying to manhandle them around on the ground. The An-22 is able to carry 80 tons and it is still in use because it is useful. They did their sums and decided that an aircraft that could carry 120 tons would be useful. this means the An-124 could carry 2-3 tanks or a larger number of IFVs or pretty much any vehicle they have in service. If you want to develop an area in Siberia in the middle of nowhere then send a small group to level the ground for about 2km and then send an AN-124 with heavy equipment and materials to set up a runway and air control, and then you can start flying in trucks and other bits and pieces and before you know it you have an airport from which you can set up a small town and start looking for oil with no link to the road or rail system. It costs millions of dollars per km of road and it is quite difficult in siberian conditions so the heavier the stuff you can carry the less you have to put together when it arrives the better. Lots of industries work with big things that are easier to transport as one thing like train locomotives etc. For the same reason there are Russian companies working on airships able to carry payloads of thousands of tons. They wont carry them thousands of kms but they could carry enormous objects from ships actually out at sea inland and place them where they are wanted even if there are no roads or rail lines to access where they are put. Aviastar can not get permission for him to "Antonov"
In the Ulyanovsk aviation plant Aviastar-SP have problems with the renewal permit Ukrainian "Antonov" for the repair of aircraft An-124 Ruslan. The current contract expires in December. According to experts, the Ukrainian side is trying to do better for themselves the conditions of the restoration of the AN-124 in Russia. But the decision has also not accepted, then how to repair the AN-124 against a possible discontinuation of aircraft "Tu", may remain the only job for Aviastar. As the "Y", scheduled for October 26 to sign a new contract between Ukrainian state corporation "Antonov" and "Aviastar-SP (included in the United Aircraft Corporation, KLA) has broken. The contract refers to the right of the Ulyanovsk plant to repair aircraft An-124 Ruslan, intellectual property, which belongs to the "Antonov". The draft treaty was to identify any new conditions of interaction, or to extend the current document (a copy of the minutes of the Committee of the Russian-Ukrainian Interstate Commission, which is discussed above, is available to the "b"). The term of the contract concluded in 1999, expires on December 31. But was submitted to the Committee meeting held on 27 October, the option contract was not signed, although the documents were reviewed at the meeting. Reasons for delays signing parties do not disclose, however, argue that until the end of the year, all documents will be agreed. "Most likely, we extend a licensing agreement with Aviastar-SP" - said "Y" head "Antonova, Dmitry Kiva .- conflict between us, there is some debate, but it is a normal business process. We sent them to his version the contract. " A source in the KLA believes that "Antonov" awaits decision on whether the renewed production of "Ruslan" on Aviastar (KLA leadership earlier estimated amount needed to run the investment program of $ 1 billion). In November 2009, President Dmitry Medvedev instructed the government "that the draft state armaments program through 2020 creation of 20 upgraded An-124, as well as to assist the KLA in the promotion of the products in domestic and foreign markets." But the armament program has not yet been adopted. According to the minutes of the meeting of the Subcommittee on Cooperation in the field of aviation industry of the Russian-Ukrainian interstate commission, Russia sends Ukraine forecast production of AN-124 by mid-November. If the issue of "Ruslan" in the short term will not be renewed, said the source of Kommersant with the KLA, "Antonov" may amend the provisions of the treaty by introducing a fee from Aviastar for permission to carry out repairs. If the Antonov An-ban repairs 125 per Aviastar, it threatens to stop the plant: last week, President Alexei Fyodorov, UAC said that the release program aircraft "Tu", which are made in Ulyanovsk, will be closed. Russia now has 14 Antonov An-124 operated by commercial companies (a group of Volga-Dnepr and Polet), and 24 - Ministry of Defense. According to expert estimates, repair and maintain the airworthiness of a commercial An-124 cost about $ 3.5 million per year. Terms of repairing military aircraft were not disclosed. Head of Analytical Services Agency AviaPort Oleg Panteleyev no doubt that the treaty will be concluded. But, he explains, concerns about the Russian and Ukrainian aircraft builders association aviation industry issues between the two countries leads to the fact that the specific solutions needed for actual projects slowed. The head of the consulting company Infomost Boris Rybak believes that the closer the time of resumption of production, the stronger parties to defend their interests. "Three or four years ago, the issues of existing treaties no one cared," - he said. But now, the expert adds, "Antonov" aircraft as a developer, wants to secure maximum advantage, and the signing of these documents makes it possible to solve such problems. Austin wrote: Can some one tell me what was the purpose of building a huge transport aircraft like An-124 for Soviets , I understand it carries heavy load and has long range but were these built as part of specific warfare doctrine ? An-124 was built to replace the An-22. Most were supposed to go to VDV but the collapse of the CCCP sent them to hauling freight. Funding for the project was waiting on foreign sources in a JV. We were begging the Germans a couple months ago for that very thing. The thing is that the Russian land forces are moving to a new force structure that has mobility as an important cornerstone. The light and medium brigades are supposed to be mobile... but the heavy brigades will not be enormous in number either so it will need to be mobile too. This new emphasis on mobility will mean lots of available transport aircraft. I hear you say... what about all those An-70s they want to buy... well they will need those just to replace the Il-76s they use for transporting VDV units and they wont be available for the normal brigades. The company intends to acquire a total of 40 An-124 jets by 2030 (20 ones specified in the firm contract + an option for another 20). The contract’s total amount is $8 billion. Various modifications of An-124 aircraft will be acquired within the framework of the contract, including Аn-124NG. It will have the extended range, reduced emission and noise footprint and increased fuel efficiency. The jet’s engines will have the service life of 70 000 flight hours. An-124NG will have the glass cockpit and new avionics. The An-124 is a strategic cargo airlift plane not a tactical transporter like the Il-76. I'm not even sure if the cargo compartment in the An-124 is pressurised. And Aviastar will modernize and repair 6 An-124s for the MOD. Ruslan has a bright future! For transporting large amounts of heavy kit the An-124 is hard to beat, but the primary transport aircraft for the VDV will hopefully be the An-70... its lower flight speed capability should make parachuting easier, while still having the payload capacity to carry everything the VDV uses. The Kuznetsov design bureau, part of the United Engine Corporation (ODK), unveiled a new geared turbofan design at the Engines 2000 exhibition in Moscow last month. The PD30 is proposed for an upgrade to the Antonov An-124 Ruslan heavy airlifter, which is currently powered by the Ukrainian Ivchenko Progress D18T. The PD30 could also power Russia’s proposed widebody airliner, known as Airplane 2020. Kuznetsov promises low noise through the use of a new low-speed fan with rotational speeds below 340-350 m/sec (1,115-1,148 ft/sec) to comply with upcoming ICAO standards. Levels of NOx, CO and hydrocarbon are two, 10 and 15 times less than ICAO 2004 requirements, respectively, through use of a multi-fuel-injector combustor with a life of 30,000 flight hours before removal. This unit has been tested on industrial engines during an 8,000-hour run. The reduction gearbox is the most complex part of the project. It uses sliding bearings tried on Kuznetsov’s experimental NK93 propfan. Key technologies come from the 33,000-hp unit developed for the An-70’s D27 powerplant. The hollow blades are considered lower risk since Kuznetsov has already tested elements of their design on the NK56 and NK44 in the late 1980s. The blades will be manufactured at ODK’s new factory in Ufa, which specializes in diffusion soldering. Kuznetsov has issued manufacturing documentation for the PD30 and expects the engine to be mature enough for series production in four to five years. Should the engine be selected for the Airplane 2020 program, its fuel burn could be lowered through higher bypass ratio and higher gas temperatures. [Production of the NK32 was restarted recently, with some 40 engines already manufactured. This is interesting... 40 new engines would be enough to equip 10 Blackjacks... I wonder if they are going to make a larger number of engines and modify them for the 30 odd Tu-22M3Ms they are going to upgrade by 2020? They are going to upgrade all their Blackjacks which means 16 or so aircraft, which is 64 engines, but if they modify the NK-32s to fit the upgraded Tu-22M3Ms then making another 60 engines plus a dozen extra for each aircraft as spares would improve commonality of engines and reduce operational costs.